These plans can be produced for both domestic and commercial clients. Boundary surveys are carried out for both domestic and commercial clients. In many cases where planning permission is being applied for, a key part of the application proposal will be a measured survey which can be used to show the existing situation, and as a base for depicting a proposed development and its likely impact upon the surroundings. 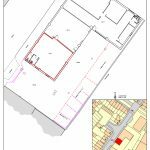 Location, height and proximity of neighbouring features and buildings, road visibility splays and similar relevant aspects can all be addressed using accurate measured survey data and plans.